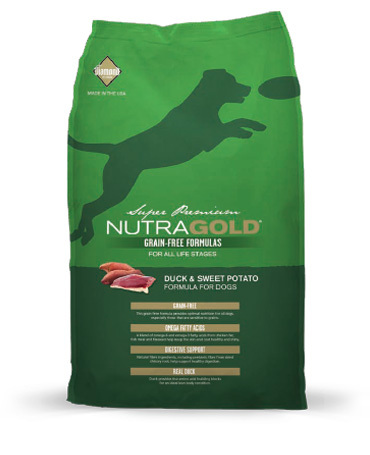 The first ingredient in every NutraGold Grain-Free formula is real meat, a highly digestible protein source. High-quality turkey, duck or whitefish provides superior taste and lean protein to help maintain a healthy weight and strong muscles, while sweet potatoes provide complex carbohydrates for all-day energy and added flavor. A potentially hypoallergenic protein source rich in omega-3 fatty acids, whitefish is the single protein source in our Whitefish & Sweet Potato formula, helping minimize food sensitivities. All three NutraGold Grain-Free formulas were specifically developed to provide the essential nutrients your dog needs for overall health at every stage in life, from a growing puppy to an aging senior. We take pride in making pet foods we would be proud to feed our own pets. All NutraGold formulas are made in state-of-the-art facilities in the USA, with the highest quality ingredients. To learn more about how NutraGold ensures the quality of our products, click here, or take a tour manufacturing plant.